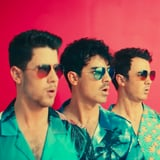 The Jonas Brothers Have a Brand-New Music Video, and It's the Epitome of "Cool"
After replaying "Sucker" nonstop for a month, we now have a new Jonas Brothers song to obsess over. On Friday, the band dropped their second single and accompanying music video since reuniting: "Cool." The song is a catchy, upbeat track that we can already tell is going to be one of our Summer anthems this year. In between spending time with Sophie Turner and Priyanka Chopra in Miami last month, the brothers were spotted filming the video, which is a colorful, '80s-inspired romp around the beach. Kevin, Joe, and Nick were pictured getting themselves into all kinds of crazy situations, including sunbathing on the roof, rocking out on the beach, and wearing '80s suits on a boat. Needless to say, the video doesn't disappoint. Watch the video for "Cool" above, and then cross your fingers that they'll release another Friends parody for us to giggle over.